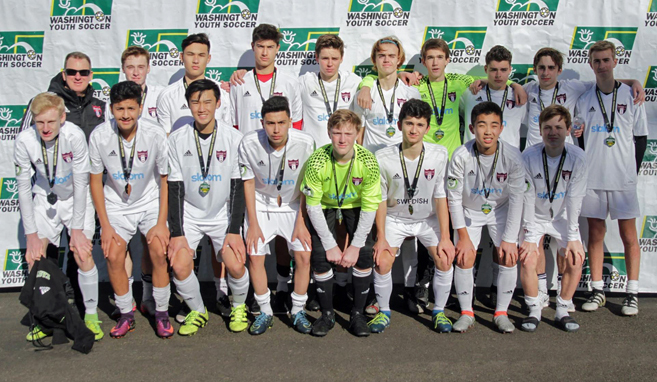 (Feb 12, 2017) The high-school-age boys of Eastside FC, U15 through U19, enjoyed another remarkable Washington State Cup season, with fully ten teams finishing in the quarter-finals or beyond: eight teams stretched their soccer season into the final weekend, which wrapped up today, with four left battling on the pitch for the state's top honors. Only the boys of Eastside FC B00 White made it all the way through and hoisted the coveted Presidents Cup together, as a team, after the final match. 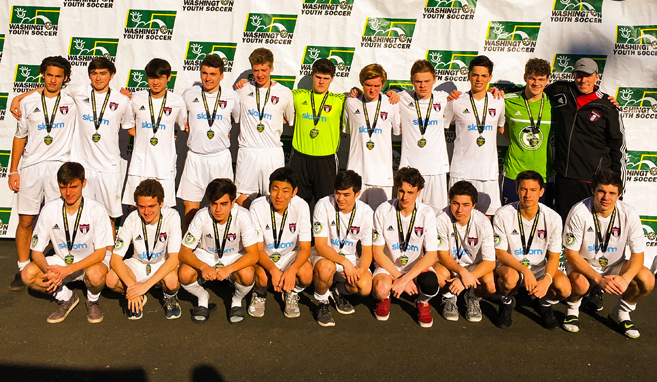 Eastside FC B00 White, coached by David Wharton, made an incredible run, allowing only a single goal in its six games of the tourney, the best defensive record in the BU17 division. The sole goal against was an own goal in the semifinals against GS Surf B00, but the Eastside boys ultimately prevailed, 2-1, to move on to face Kitsap Alliance FC B00 in the final. It took a staunch defense and a single goal, their 15th of the tournament, to win the day. "This is a very special group of players," says Coach Wharton. 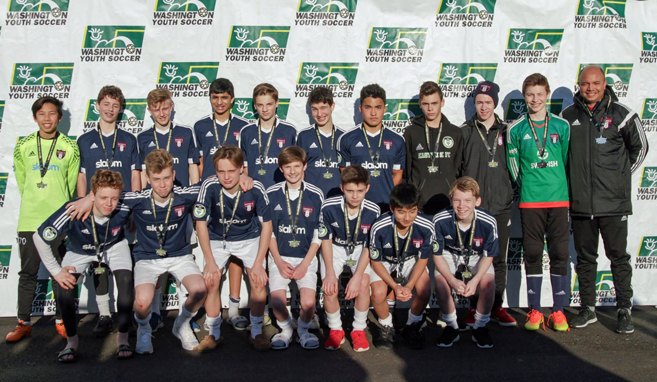 "The team was formed with players from eight different teams last spring because of the age change implemented by US Youth Soccer, but they have been a close-knit and committed group from the very beginning. They are tremendously talented players, but it's their desire to learn, improve, and to help each other be successful that really sets them apart." "They inspire me every day," he added. "We can't wait for Regionals in Salt Lake." The team moves on to the US Youth Soccer Region IV Presidents Cup, which takes place June 12-18 in Salt Lake City, Utah. It will compete for a regional championship and a spot at the 2017 US Youth Soccer National Presidents Cup, July 12-16 in Auburndale, Florida. "This is a great accomplishment to cap what has been a very successful season," affirms Coach Tom Bialek, Eastside FC's Coaching Director. "Congratulations to Dave for his leadership, and to the players for their great performance. They represented the club with class." One of Washington Youth Soccer's competitive state-level tournaments, the Washington Youth Soccer Presidents Cup (formerly "Challenge Cup") was designed to enhance the accomplishments and skill levels of competitive U11 through U19 players. With more than 300 teams participating from across the state, the Presidents Cup provides an ideal environment for players to develop their abilities as individuals and as a part of a team. The US Youth Soccer Washington State Championships is the most prestigious tournament and showcases the highest level of competitive play within the state at U12 through U18 age groups. Each year the tournament attracts over 6,100 participants and thousands more spectators and fans. 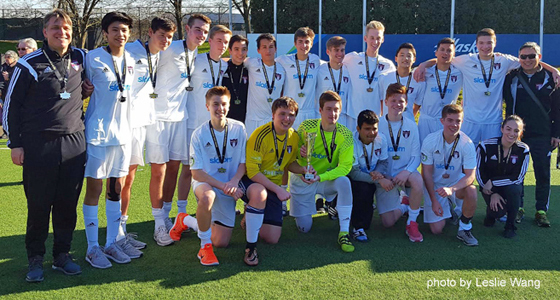 Click here for full 2017 Washington Youth Soccer Presidents Cup results. Click here for full 2017 Washington Youth Soccer Championships results.